Former Vikings punter Chris Kluwe announced his intentions to file suit against the Minnesota Vikings at his press conference Tuesday morning. At a press conference this morning, Chris Kluwe announced his intentions to file suit against the Minnesota Vikings if they don't release the investigative reports. 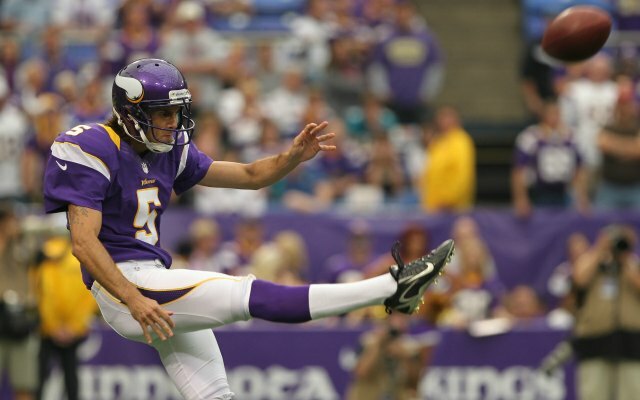 A former Vikings punter, Kluwe brought allegations against the Vikings six months ago claiming that special teams coach Mike Priefer had made homophobic attacks on him as a member of the team in 2012. The team then launched an internal investigation before reportedly informing Kluwe on Monday that they would not be releasing their investigations' final report to Kluwe or the public. “Sweeping it under the rug and keeping the report private does not help," Kluwe explained during his press conference. Kluwe's officials says they know it has been substantiated that Priefer made a "nuke the gays" statement and Priefer admitted. Priefer was supposedly interviewed three times and "finally told the truth the final time", according to Kluwe's attorney. Vikings GM Rick Spielman was also mentioned and Kluwe's attorney claimed he knew about the allegations, as well. "The Vikings are not above the law, but they appear to be acting as they are," said Kluwe's attorney Clayton Halunen. They also claimed the Vikings are unwilling to release the investigative report to Kluwe's team or the general public. Kluwe and his legal team plan to meet with the Vikings on Thursday to discuss action. “We would like to resolve this out of court if we can," explained Halunen. The Vikings and Kluwe's team reportedly were discussing a settlement, of which $1 million would be contributed to LGBT causes. Halunen indicated they are far away from reaching an agreement and a lawsuit seems to be the next step. Kluwe's legal team is still deciding whether this trial will take place at the state level, but they have established the basis for lawsuit. They will claim Defamation, Religious Discrimination, Tortuous interference with contractual relations, and Retaliatory termination. The Vikings released a statement prior to the press conference, announcing that the investigation had not yet been completed. 1) Special Teams Coordinator Mike Priefer made offensive and insensitive remarks in Kluwe’s presence. 2) Representatives of the Vikings had knowledge of these comments prior to the Deadspin article publication on January 2, 2014. 3) Kluwe’s activism was the reason for his release from the Vikings on May 6, 2013. Magnuson, Madel and others spent nearly six months conducting an exhaustive investigation. After the Vikings were given the investigative materials from Magnuson and Madel, in order to further maintain objectivity and integrity, the team engaged a nationally-prominent law firm – Littler Mendelson P.C. – to evaluate employment law matters and provide findings and recommendations to the Vikings. Those recommendations are to be provided to the team this week. As we have consistently communicated throughout this process, the Vikings will have further comment when the investigation is entirely complete and the team has made determinations on next steps." The Vikings organization will be under pressure over the coming weeks to handle this issue and release the facts. All of this comes just eight days before the Vikings report to training camp in Mankato, MN. Stay tuned for the latest details, as Kluwe and his legal team prepare to file a lawsuit against the Vikings organization.